Summer is rapidly coming to a close but take advantage of the last of the grilling season to make these dynamite bacon jalapeno popper brats. Inspired by the addicting appetizer, bratwurst sausage are cooked in beer and then finished off on the grill while being wrapped in bacon. The brats are served with a rich and spicy cream cheese sauce that is studded with fresh jalapenos. Instead of going for the classic barbecue sides, try eating this meal alongside a refreshing corn and red pepper salad or a guacamole potato salad. Step 1: Heat a saucepan over medium low heat. Place the brats in the pan and add the beer. Bring the mixture up to a simmer and cook for 10 to 15 minutes. Remove from beer bath and allow to cool. 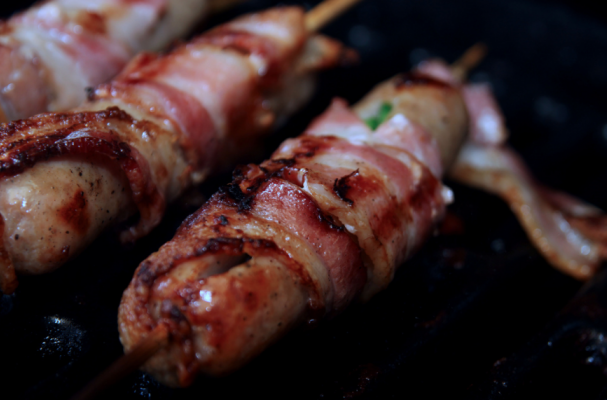 Step 2: Wrap the bacon around the brats, securing it with a toothpick or skewer. Step 3: Heat the grill over low heat and cook the brats until the bacon has turned light brown and crisp. Step 4: Meanwhile, melt the butter and cream cheese into a saucepan, stirring occasionally. Once melted, add the milk and parmesan cheese and whisk until smooth. Season with garlic powder, cayenne pepper, salt and pepper. Add the chopped jalapenos and mix again until well combined. Cook the sauce for another 2 to 3 minutes. Step 5: Serve the brats in a toasted bun with the jalapeno cream cheese sauce over the top and the crunchy onion topping.